HOPE Preschool is an early education center serving children ages three through five years and their families. HOPE Preschool is a ministry of Crossroads United Methodist Church. HOPE Preschool is a Christian-based preschool. 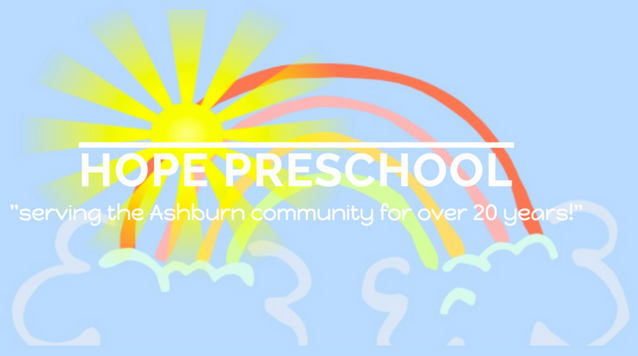 HOPE Preschool first opened its doors to the Ashburn community in 1992. Since then, HOPE has become a model preschool in the area serving nearly 250 students and their families each year. HOPE Preschool's teachers are CPR, First Aid and EMAT trained. Children are offered music classes with on-staff Music Teacher, Christmas Musical Program, Outside Playground/Indoor Playroom, Weekly Bible verses, Monthly Praise & Celebration Program, School-wide Mission Programs, Parent Orientation, Mother’s Day & Dad’s Night Celebrations. HOPE Preschool celebrates Week of the Young Child with a school-wide theme and offers Summer Camp opportunities for children. For more information, please visit Hope Preschool online.